Well the results of my most recent radio poll are in, and we did something new this time around: we used Facebook Questions to conduct the poll. This meant that I could control the voting by ensuring people were not voting more than once, but it has the drawback that only Facebook users voted, and those that voted could be seen by everyone - a bit of a privacy issue that I'm not really very comfortable with. So the search continues for me on how best to collect your votes. Click to make this bigger! Straight away you can see 2 things: Hi FM lost a lot of votes, and Merge gained more votes in the same period. Hi have suffered from the reduced number of votes more than Merge has. The overall number of people still listening to MP3's is less as well. The Ewoks over at Sultanate of Oman 90.4 have made a small increase in listeners - indicative of at least a steady audience. And that is really the crux of my choice of blog title: The Clone Wars. I remember when Merge launched, there was a lot of talk about targeting a different audience than Hi FM, along with merging different cultures into the big Sabco melting pot that was Merge FM. And I guess to a point, they have done this: every hour or so there is the odd Arab-themed track and the way-back playback of the 80's (lately I've heard U2 with or without you a few times!). However, the over-whelming majority of the music is pretty much exactly the same as Hi Fm. Hence: The Clone Wars. It certainly seems that by mixing in the odd Hindi or Arabic track, along with the odd 80's retro track, people seem to enjoy the blend, and more of you are switching on to Merge. I contacted some of you who voted on Facebook and asked you what it was you liked about Merge, and Hi FM for that matter. Interestingly, it seems the general reason for people liking Merge or Hi is the music - of course there are fans of the radio presenters, but the overwhelming majority of you don't really care about the radio presenters, unless they are annoying you. Personally, I've found myself switching stations a lot more frequently recently - if Hi are playing a track I don't like, I'll switch to Merge or 90.4 Oman FM. I've noticed Hi FM have commercialized their output heavily. One might say too heavily, I don't know - but people seem to be switching over to Merge in greater numbers, and this could be a key driver for the switchover. It's not all a one way street though, Hi have copied Merge in some things to, most notably the 10am-noon segment (Merge's At work network) is now the same as Merge - pre-recorded and not "live" (Darren seems to be providing the voice links between songs, which can be done easily). In a change to Merge though, Hi have now got live DJ coverage up to midnight, with Marcus Monopoli driving the show from 8pm to midnight - Merge just has pre-recorded shows in the same time slot, with the Muscat drive ending at 8pm. Interestingly, on 90.4 there are also live shows up until midnight (or possibly after). I had a good giggle listening to the 90.4 presenter the other night with his American-British accent; he was trying to give away a prize and wanted someone to call in with the name of the CEO of the Oman Football Association - the first guy who called didn't know and just wouldn't hang up, then a girl rang in and announced that she didn't know the answer but she had just baked some cookies and would he like some? Classic, I can honestly say I was very entertained by it all. I've no idea if the presenter (their website - yes I finally found it - looks like it's not been updated since 2002 and so I've no idea of the guys name) ever did manage to give away his prize, but perhaps he got some tasty cookies! 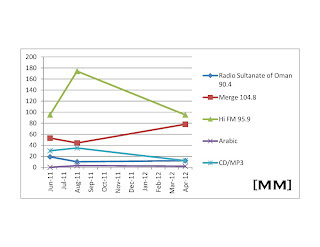 Hi FM continue to dominate the market and still have the largest audience. Their branding is also more readily recognized and present in our lives around the Capital (sorry those of you from outside Muscat!). This last winter, Hi have been involved in a number of large concerts with world-class acts and have diversified their brand as a result. Hi FM are obviously a radio station, who also dabble in live concerts and comedy events. Merge on the other hand, have not really competed on this front, with a few exceptions: Hed Kandi & Yanni. Hi FM are technologically more advanced than any of the competition: There's an iPhone and Android app for listening to their radio stream which have a handy track log of songs played. In addition to this, Hi FM employ true RDS (Radio Data System) which allows them to scroll small text messages on radio receivers capable showing the name of the track being played, or the Radio Presenter currently on air. Neat. The people at Merge tell me they have the same technology but have chosen not to use it at this time. Hi FM also continue to have regular news broadcasts whereas Merge doesn't, however, it is apparent that the current news broadcasts provided by Hi (from Feature Story News) are "yesterdays" news in many cases. Quite frequently I hear the exact same news broadcast driving home at the end of the day as I do when I'm driving to work that morning, so the news, in my opinion could be improved upon. Some of the people I contacted after their votes in the poll also said the same thing: The news is nice, but out of date. 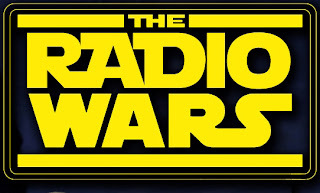 The only other broadcaster in this race who give the news is of course the loveable Ewoks at 90.4 Radio Sultanate of Oman, except 90% of their news consists of who His Majesty sent cables of greetings to that particular day. Faiq over on 90.4 has focused even more on playing music from the 60s/70s and 80s and is still steadfastly dishing out free dinners at the Radisson and other hotels on his breakfast show - and I have to admit I sometimes switch him on in the mornings on my way to work if I'm not in the mood for pop music. So will Hi FM alter their music line up as a result, or will they stay on their current format? Personally I don't see anything wrong with slipping in an occasional retro track - it seems to work with the diverse audience here. Will Merge start broadcasting news (I asked this question at their launch and they confirmed they had planned to) and will 90.4 invest in a new website? More soon - and for those interested, Oman lost to Senegal last night, 2-0. Shame. LOOOL.... The Clock tower pic is pure genius! Love it! 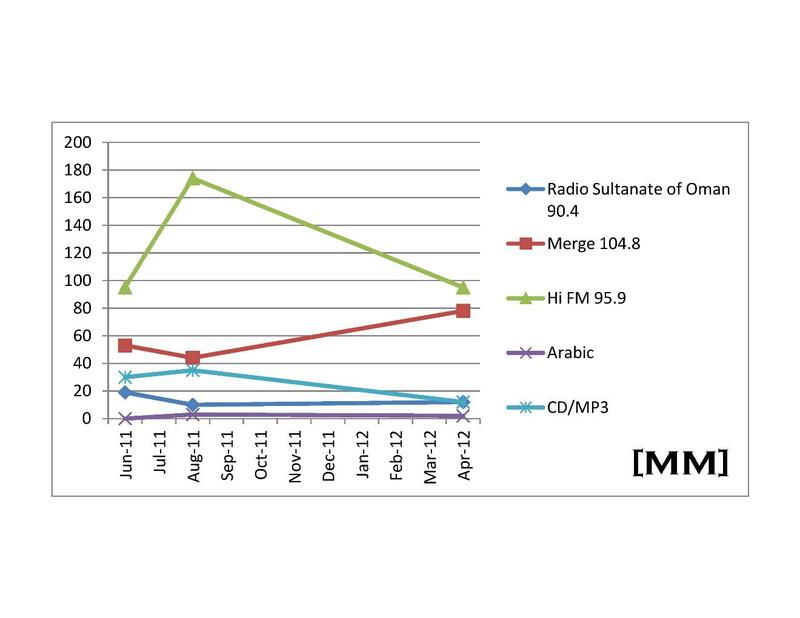 Do Oman FM 90.4 stream? I miss ol' Fiaq on the Mic and his regular 'Puff the Magic Dragon' to the kiddies on the bus. Classic. Not to be a stickler for details, but extrapolating the data onto a graph with number of listeners on one axis and time on the other axis is the wrong approach. It shows inaccurate results because your sample size(i.e. the number of people who voted) is different in both cases. It would be more accurate if you plotted a percentage of listeners Vs. time graph - that would give a more accurate picture :D cheers! Yes your right, but I spent enough time on this post anyway to go changing things!